A Russian Soyuz spacecraft carrying two rookie cosmonauts and a NASA shuttle veteran blasted off from the Baikonur Cosmodrome in Kazakhstan Monday evening (U.S. time), streaking into orbit and setting off after the International Space Station. Mounted on the same launch pad used by Yuri Gagarin to become the first human in space 50 years ago April 12, the Soyuz TMA-21 spacecraft roared to life at 6:18:20 p.m. EDT (GMT-4), the moment Earth's rotation carried the pad into the plane of the space station's orbit (4:18:20 a.m. April 5 local time). 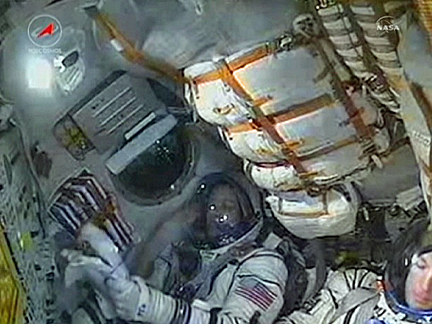 Live television views beamed down from the capsule during the climb to space showed Soyuz commander Alexander Samokutyaev monitoring cockpit displays from the Soyuz's center seat with flight engineer Andrey Borisenko strapped in to his left and NASA astronaut Ronald Garan on his right. All three looked relaxed and in good spirits. 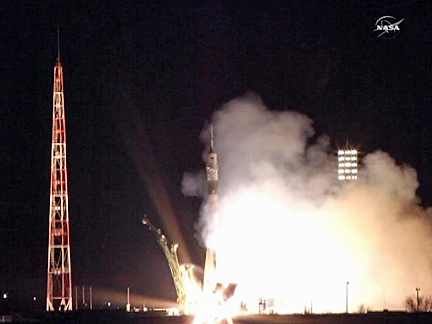 "We're doing well on board and feeling great," Samokutyaev reported as the spacecraft accelerated toward orbit. Eight minutes and 45 seconds after liftoff, the Soyuz TMA-21 spacecraft slipped into its planned preliminary orbit. Fight controllers said the vehicle's two solar panels and communications antennas deployed as planned. "We all congratulate you on successful launch, successful insertion," chief flight director Vladimir Solovyov radioed from the Russian mission control center near Moscow. "You are going to be fine. We have no issues." For a program steeped in tradition and memories of its greatest triumph, a Soyuz launch so close to the Gagarin anniversary is a major event in Russia and a frequent topic at pre-flight briefings. The famed cosmonaut's face and name are painted on the side of the Soyuz rocket's upper stage. "When I was a kid wishing to become a cosmonaut, it would never occur to me that I would have this chance, this opportunity, and I feel a great responsibility," Borisenko said in a NASA interview. "Great responsibility because I understand that our crew will be a symbol, an emblem of human success in space, and everybody will monitor what we do up there very closely. "We’ll have to show great work, right results, and also show that the time which has elapsed since the very first flight of Yuri Gagarin and Alan Shepard hasn’t gone in vain, that we’ve learned something in space." April 12 also is the 30th anniversary of the first shuttle flight, followed three weeks later by the 50th anniversary of Shepard's May 5, 1961, sub-orbital flight to become the first American in space. With the shuttle program's looming retirement after just two more missions and NASA's post-shuttle reliance on the Russians for access to orbit, the Cold War rivalry that gave birth to the space race has come full circle. "It really is just an incredible honor to be a part of this anniversary in that I truly believe that on April 12th, 1961, humanity became a different species," said Garan, a retired Air Force colonel and F-16 pilot making his second space flight. "Humanity was no longer bounded to the confines of Earth on that day, and in 50 years since then we’ve made some pretty big steps and we’ve done some amazing things and I think we’ve pretty much cemented that we’re not a one planet species, if we choose not to be a one planet species, anymore. "And so, to launch so close to the 50th anniversary, from the same launch pad that Yuri Gagarin launched from, and then to be able to celebrate that anniversary on orbit and then to be able to celebrate the 30th anniversary of the (first) space shuttle launch and then the first American in space as well, I think is really going to be amazing. And it’s such an honor that when we designed our Expedition 28 patch we included the name Gagarin and Shepard on it with the approval of their families to honor those two pioneers that basically helped us get us where we are today." Assuming the rendezvous goes smoothly, Samokutyaev plans to oversee an automated docking at the Poisk module attached to the upper side of the Zvezda command module at 7:18 p.m. Wednesday. Waiting to welcome their new crewmates aboard will be Expedition 27 commander Dmitry Kondratyev, Italian astronaut Paolo Nespoli and NASA astronaut Catherine "Cady" Coleman, who were launched to the space station in December. "This year in Russia is the year of cosmonautics and the prime minister of the Russian government is heavily involved in preparing the celebrations, and we think that this is a holiday, a day that everybody around the world should be celebrating," Samokutyaev said in a NASA interview. "We are very proud that we’ll be able to participate in celebrating the 50th anniversary of the first human in space. We have planned several activities; we will not be discussing them first because this is a secret for now, and we’ll be able to celebrate these important dates for everyone." NASA officials last month announced an extension to the agency's existing contract with the Russian Federal Space Agency covering crew transportation, rescue and related services from 2014 through June 2016. The contract is valued at $753 million and covers launch-through-landing support for 12 astronauts. Total cost for 42 U.S. and partner astronauts from 2007 through June 2016 is $2.25 billion. During his stay aboard the space station, Garan will welcome the final two space shuttle crews to the outpost. The shuttle Endeavour is scheduled for launch April 29, followed by a final flight of the Atlantis on June 28. "Without the space shuttle, we wouldn’t have this space station," Garan reflected. "Unfortunately, it’ll be many decades before we have the capability that the space shuttle provides us right now. To have the vehicle that could fly to space, to carry the size and the weight of the payload that it can carry, to have its own robotic arm, its own airlock, and then to come back and land on a runway and bring things back that are the same weight and the same size and to bring those things back to Earth, that is a pretty tremendous capability. "Unfortunately, we can’t continue to do that and do all the other things that we want to do as well, so we had to make a very difficult decision to end the space shuttle program. Sometimes change is hard, and in this particular case it is hard, it’s going to be a sad day when those guys land. ... But I truly believe that it’s going to lead to bigger and better things and the space shuttle’s place in history, I think, is fairly secure. It is an amazing spacecraft, amazing flying machine, and the many accomplishments that it’s made throughout its history stand for themselves."